'with words like smoke' is a clause stolen and a promise overturned, four words on a page that once spoken disappear. 'with words like smoke' is an exhibition of works that reveal and revell in their evolving forms as their initial brickworks vanish. These different works test how processes of abstraction and re-figuration might appear simultaneously and the politics of what emerges when first impressions purposefully disappear. 'with words like smoke' is a clause stolen from Samuel Beckett's 'Texts for Nothing' (1953), thirteen stories that converge under his translation of mesures pour rien - a bar's silence - the purpose of which is to carry a musical whole. During the exhibition, spoken works will interpose the visual, from the opening’s performances to a mid-point rehearsal to its final live broadcast. Carl Andre's 'Desire' (1966) sets two bodies together, facing, their limbs touching in time as we focus. 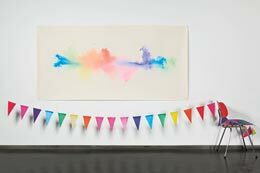 Anna Barham's 'Slick Flection' (2009) switches the terms of a tap dancer's instructions from descriptive to phonetic, the choreography shifting from the from the feet to the tongue. Aoife Collins' 'Downward Social Mobility' (2008) aligns the fall and rise of Reginald Perrin to the rise and fall of a life led rhetorically. 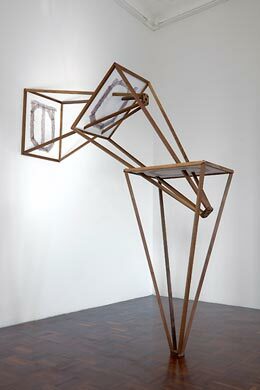 A machine-like sculpture by Kit Craig appears to churn the mute perception of things into solid, articulated forms. Marcelline Delbecq's presents to us a ghostly address, haunted by the vapours of its disappearing subject. Fergus Martin's sculpture and photograph scrutinize the mass they contain rather than the forms that they carry. Gyan Panchal’s works very subtly corrupt or alter inexpensive or industrial materials tuning them into static sculptural forms that record dissolution but suspend thorough change. Amalia Pica's new work presents traces of a social event's before and after, both moments brought together in communion. In Lois Rowe’s 'Argument for Design' (2006) exists a schism between the video's voiceover and its footage, a discrepancy played out by differing references to colour. Cally Spooner's new script will invite 27 interruptions to entirely disrupt it before its evidence is redrafted and broadcast live. Raymond Taudin Chabot's video archives comprise thousands of caption-free images collected from international press of white male politicians or political (re)activists, both parties in demonstration. As the images fall away, the gestures are reduced to a small alphabet, articulated by a familiar cast. The eighth text of 'Texts for Nothing' narrated by Irish actor Jack McGowan was recorded in 1958 and later published in an issue of Aspen magazine issue 5+6, edited by Brian O’Doherty (1967). This recording will be broadcast on Resonance with new and adapted works produced live by Anna Barham, Aoife Collins, Marcelline Delbecq and Cally Spooner. With special thanks to Curtis Brown and the Samuel Beckett Estate, the French Institute in London, Culture Ireland, and Resonance FM.